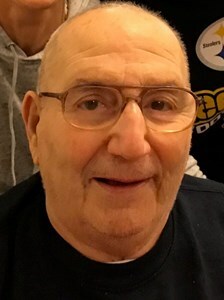 Joseph Oppedisano, 86, passed away peacefully on Tuesday, February 5, 2019 at The Teresian House, with his loving family by his side. Joseph was the son of the late Rocco and Maria Rose (Coluccio) Oppedisano. Joseph was the devoted husband of over 63 years, to Immaculate "Mackey" (Audino) Oppedisano. Joseph was a member and a communicant of Christ The King Church. He enjoyed playing poker, making his own wine, he loved helping others and spending time with his family and friends. In addition to his parents he was predeceased by his brothers, Angelo "Sam" and James Oppedisano. In addition to his wife, Mackey, Joseph is survived by his children, Joseph Oppedisano and Cindy (Jim Kennedy) Kimmerer. He is the adored grandfather of Shayna and Evan Kimmerer. His is also survived by his brother-in-laws; Paul (Pat) Audino, his sister-in-laws, Teresa Oppedisano, Rose Oppedisano and Margaret (John) Schachne and several nieces and nephews. Calling hours will be held at Christ The King Church, 20 Sumpter Ave., Albany, NY. on Saturday, February 9, 2019 from 9:00 am to 10:00 am. A Mass of Christian Burial will be at 10am at the church. Burial will follow the Mass at Our Lady of Angels Cemetery, Colonie. The family would like to thank the staff on the 4th floor at the Teresian House, especially Geraldine, Julio, Johnnie, Tammy and Kaddy. In lieu of flowers, the family requests that donations be made to Bright Horizons, 6 Winners Circle, Albany, NY 12205 or to the Teresian House Foundation/4th floor, 200 Washington Ave. Ext. Albany, NY 12203 or to the Pediatric Brian Tumor Foundation at www.curethekids.org. or to the Leukemia & Lymphoma Society - Albany 5 Computer Drive West Albany, NY 12205 in Joseph's memory. Add your memories to the guest book of Joseph Oppedisano. I'll always remember Friday night's at the Audino's, the poker games at the dining room table with Mom & Pop, Aunt Mac & Uncle Joe, Aunt Margaret & Uncle John, Pat & Paul, and my parents Rich & Marion. I can still see Pop turning down his hearing aid when the chatter got to loud...meanwhile Keith & I (being kids at the time) always trying to sneak some of Uncle Joe's famous homemade wine. While the grownups we're playing cards, us kids Jimmy, Keith, Scottie, Joey O, Cindy, Ricky and myself would play outside in the yard & alley. I learned more than just how to play poker those nights...I learned about the love of family, friendship and laughter that has lasted all these years. I will always cherish those memories. Aunt Mac, Joey and Cindy ~ Jackie & I send our deepest condolences for the loss of Uncle Joe. He will be deeply missed and all of you are in our thoughts and prayers. We love you and God Bless. May Uncle Joe Rest in Peace. I would like to share some of my childhood memories of Uncle Joe. Once while hunting with my father who would never take a break or stop hunting, Uncle Joe laid down in the field to take a nap and we picked him up on the way back. He was happy and relaxed and my father and I were tired. Another time I remember pouring the concrete at Nanny's on 2nd Avenue and Uncle Joe never stopped working till the job was done. I remember the skill he had smoothing that concrete, something I will never forget. He was a kind man that always made you feel welcomed at his home. He will be missed. Our deepest condolences to a wonderful family. Joe was an incredible person, a dedicated husband a loving father and a perfect Papa. When my twins were babies they called him papa because Shayna and Evan did and not once did he ever correct them. He spent countless hours playing with the kids. He was just a beautiful and loving human being. Ani, Jeremy and the girls. I knew this day would come. But one is never prepared. I’m so glad I came to visit you last night. You have suffered for the past 3 years with this horrible disease. I never got upset, I knew it wasn’t you. EVERYTIME I saw you you had a smile and made me laugh. You still had that same smile when I saw you today for the very last time. You’re at peace now , I know that. And that makes my heart happy. Love you forever ??????? ?